Resident Evil: Revelations 2's two teams of complementary characters make this a fantastic cooperative experience, whether you're playing through the story or the ever-engrossing Raid Mode. Resident Evil: Revelations 2 is a survival horror adventure built for two with a cooperative story that emphasizes teamwork by giving both players complimentary playstyles. If you've not played 2012's Resident Evil: Revelations, fear not. This sequel is its own, self-contained tale - tense, but cheekily self-aware - supported by top-notch voice acting that makes it easy to get invested. And even after all four episodes are done, several new challenges open up, giving you ample reason to replay the adventure or drop a half-dozen hours into the engrossing Raid mode. Revelations 2 is broken up into four episodes, and there are two sides to each one. The A-side features series veteran Claire Redfield and newcomer Moira Burton, daughter of Barry "What IS this?" Burton. The two have been kidnapped by a mysterious organization and must work together to escape a zombie-infested penal colony run by a mysterious overseer. The B-side stars the aforementioned Barry "This hall is dangerous!" Burton, along with creepy supernatural child Natalia Korda. Barry is retracing his daughter's steps, and his no-nonsense approach to dealing with Natalia and their situation is comedy gold. As we previously reported, Capcom has told Eurogamer that the online mode for the action-packed Raid Mode will go live on March 31. Capcom says it doesn't have any plans to enable online support for the local co-op-tional campaign, but it always intended to bring Raid mode online after all four episodes went live. Similar to 2010's Alan Wake, Revelations 2 treats its story like a TV show. We meet our heroes, learn about their plight, and gradually more mysterious characters and unanswered questions are introduced. The whole thing then concludes on a last-minute twist - complete with a "Next time, on Revelations 2" - that leaves you hungry for more. But while the structure is sound, the content can be shaky. Two of the game's four episodes are wonderfully paced, kicking off with Team Claire blasting through hoards of undead and facing down some horrific boss monster at the climax. Then Team Barry steps in, easing you into a more puzzle-oriented approach. Shuffling an oversized battery between different conveyor belts may sound dull, but it's a nice contrast that balances out all the gunplay. There's a yin and yang to it that you really don't appreciate until you play the other two episodes, which give too much of one, not enough of the other. This is especially noticeable in the final episode, where Claire's story is rushed to an unsatisfying end, while Barry "He's insane!" Burton's drags on endlessly. Teamwork is crucial in Revelations 2, making the game's lack of online multiplayer really sting. You can freely switch between the characters when playing solo, but it's far more enjoyable coordinating with a buddy - just make sure they're within arm's reach. 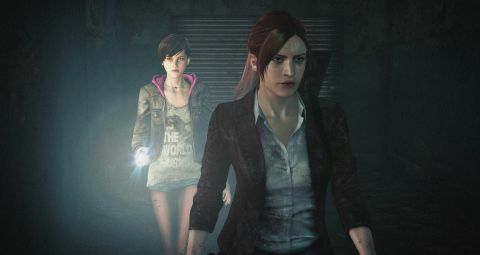 In both of Revelations 2's pairings, one player is the attacker, while the other plays support. Claire and Barry "the Master of Unlocking" Burton handle the firearms, while Moira and Natalia can find hidden items and fight using melee weapons. This is a nice contrast to RE6, where both players could easily drop dozens of enemies. Here, you really have to synergize with your partner in order to survive. Claire and Barry want to drop enemies quickly and efficiently with steady, well-placed headshots, while Moira and Natalia provide assistance by blinding enemies with a flashlight or highlighting weak points, respectively. Zombie attacks hit hard, which keeps the encounters feeling tense and all the more rewarding when you work efficiently and emerge without a scratch. Finishing an individual episode of Revelations 2 takes around two hours, but that's just the beginning. There are several incentives for replaying an episode, such as the panic-inducing invisibility mode, which renders all enemies invisible unless Moira or Natalia points them out. It's a fun and stressful mode that emphasizes Revelations 2's focus on teamwork. However, Raid mode is the real time sink. This is the game's ‘horde mode’, similar to Mercenaries in previous Resident Evil games. But while Mercenaries is about perfection, Raid Mode is about progression. You're constantly unlocking new weapons, characters, abilities, and so forth to customize your play style. It's like a bread crumb trail, only the "crumbs" are "pistols" and "stun ammo." What's great about Raid mode is that it doesn't take anything seriously. Instead, it's all about the variety, both in the weapons and the enemies you face. Fighting a fire zombie? Switch to your machine gun and load it up with ice bullets. Fighting a zombie with an energy shield? Use a magnum to punch through it. Mixing and matching tactics to fit what the game throws at you is a continually enjoyable challenge, and one that's always changing as you level up and attempt new stages. For fans who were miffed by Resident Evil 5 and 6's penchant for zombie-judo, Revelations 2 will wrestle your fears into submission. The game has its fair share of action, but its somber tone and strong emphasis on ranged gunplay put it more in line with RE4 than the other modern games. Its two teams of complementary characters make this a fantastic cooperative experience, whether you're playing through the story or the ever-engrossing Raid Mode. This game was reviewed on an Xbox One. Description Claire Redfield and Moira Burton, S.T.A.R.S. member Barry Burton's daughter, have been kidnapped. Discover who kidnapped them and why in this weekly episodic survival horror adventure.